The fifty project implementation took place from Nov. 2007 to January 2008, funded by Help Age International, which enabled PADI to build 7 improved traditional water wells in Mshangano ward in total over 6200 people are benefiting from the project. There are over 6200 (where 3300 are women and 2900 men) people accessing safe and clean water in the project area where PADI has constructed 39 improved traditional water wells and 1 bore hole which include three wards ( Mshangano, Matogoro and Mletele wards) financed by Run For Africa, Help Age International and Peace Corps. 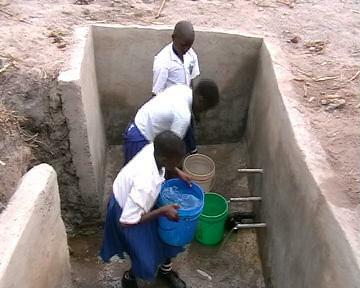 1500 of school children are getting water which include Chandarua and Liwumbu primary schools where each received one Improved traditional well while Mdandamo secondary school got one borehole last year financed by Run for Africa and Peace Corps. Over 3500 (where 2000 are women and 1500 are men)of other people are getting other benefits including vegetable production and building construction one of those benefiting from this is Mdandamo Secondary school where after being supported with one bore hole they managed to start growing vegetables and increased school building because water availability near the school compound is possible, the same work was impossible before the bore hole and if they did the work was not effective. We have been agreed with each village community to contribute to the project by doing the following : Collecting stones and sand, clearing the site, providing a team of 10 people to support water well technician at their own costs, at the same times they will be monitoring the project progress to see if the materials budgeted are being used as required and the required quality wells is observed. 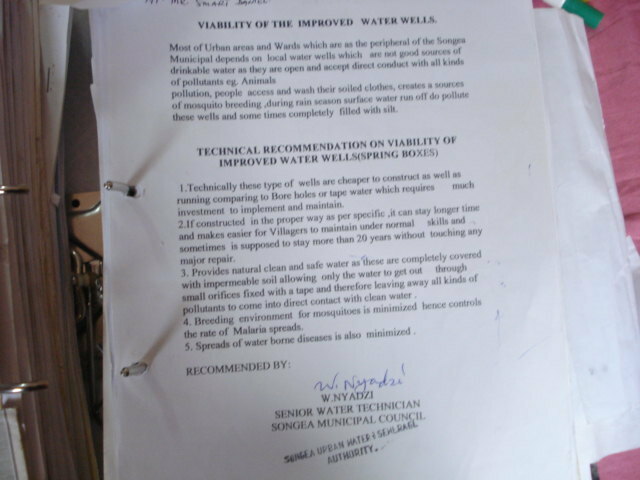 Formulation of Water Maintenance Fund ( WMF) to sustain the wells maintenance will be done . To make the wells are well maintained it has been planed that the community will meke contribution to the WATER MAINTANANCE FUND ( WMF) ACCOUNT at the rate of USD 8.7 for each well per year for four years consecutively which will help to do miner repair. Then after the community will sit and evaluate the well progress. The experience shows that the improved traditional water wells can need miner repair every after 4 years, but general surrounding cleanliness is dode weekly. This type of the wells does not demand much money to repair.After 4 years the community may sit again and plan the rate to contribute for the fund depending on the economic situation considering the inflation. More detailed see the attached file. Detail for community See the attached file for project Bedget. Please explain the numbers: we would like to see the numbers that going to be impacted by this proposal. Reading the text, it appears that the numbers refer to the people already helped by earlier projects (39 wells and a borewell) or one could read it as the total population. It is the same problem in both the applications. For funders it is important to see an estimate of the number of beneficiaries. The “Project Background” provides good clarity on the history of the work. Could you please explain a bit on the geographical spread of this work and how close the new projects will be from the old. Is there some estimate of how much coverage is being achieved and how much is left? Out of 24 villages in the three wards where we planned to cover only 9 villages have been covered , 16 of them are not yet covered in our targeted areas( semi rural wards in songea urban) where we expect to cover other 4 villages this year. The distance from new to old projects is approximately 1-5 km. Can you explain in detail what "stream capping"? If you are referring to some "traditional" water wells, I think it benefit so many of us who may be caught up in the new technologies what makes this "traditional"
I would like to hear more about how you pick your people who will do the maintenance, supervision, who are the implementers. The two people who will be maintaining, are they volunteers? The supervisors of the well implementation, are they staff from PADI and what is their role in follow-up, M&E, etc? Who collects the money and monitors the WMF? What have been your challenges in picking the "right" people in the community to take on some of the responsibilities? Have you had any issues of corruption or misuse of funds? If yes, what did you learn? Dear Gemma, thanks for the questions. sealed with clay and backfilled with said. 9. Improvement of water flow from the improved well is then carried out. ii)The people who will do the maintenance supervision and implementers are being picked by the villagers under their village government leaders supervision. iii) The two people who will be maintaining the wells are volunteers from the well location ( village). To encourage them or to recognize their work,PADI make yearly wells evaluation, those who have managed to care well their wells are being awarded each year from PADI office Tsh. 5,000-10,000/- but as the program/project is expanding we plan to use those who perform well in caring the wells in educating others to do the same as part of awarding and recognizing their effort. iv)The money are being collected by the Water wells committees and being monitored by PADI in collaboration with village government through reports and visiting the well sites..
v) The supervisor always is coming from PADI staff (Project Manager and Project Technician) working hand in hand with the wells monitoring committee(WMC). vi) The challenges we are facing on getting the right person to take some of responsibilities is not very big because the right people are being picked by themselves(they now well each other) in the village. If it happens that the person is not doing as they have been expecting to be they always re pick others. In case some one has misused the fund , the responsible person is required to pay and be discontinued from duty. Misuse of funds is minimized by conducting village meeting quarterly and all money are kept in Bank ,only taken when needed and approved by the committee. (Receipts and bank pay in slip are being checked comparing with actual contributions made in each quarter). Thanks Iskaka. Could you please help us with the mixture ratio for the well construction and how thick will be the walls? Could you please help us with the mixture ratio for the well construction and how thick will be the walls? The ratio for the well construction is 10 : 1 ( sand: cement) enough to get 20-25 cement sand block bricks. And the thick of the wall depends on the size of the bricks. The term "getting sanitation" usually means that people get access to sanitary latrines, typically with access to water to wash their hands. However, in this proposal, people are apparently "getting sanitation" by "using safe and clean water they have been supported". Is this really "getting sanitation" in the sense that most people mean? Dear Rick McGowan, The Ideal behind was they are using clean and safe in the project area as the source of water to them, the same water being used in sanitation including washing hands and latrines. But we did not mean they get sanitation because they have safe and clean water. The Ideal behind was they are using clean and safe in the project area as the source of water to them, the same water being used in sanitation including washing hands and latrines. But we did not mean they get sanitation because they have safe and clean water. Sorry the Beneficiary number who are going to be impacted by this proposal didn’t appear in our project Background, it appeared only in short project description which is 3000 it has been estimated that number of beneficiaries will be 100 people per well who are part of the total population of is 5,000 people. It is true that the Number of people benefiting from the past projects is the same in both applications because the project we expect to implement this year will be in the same wards we implemented last projects except it will be in different schools and villages. The beneficiaries are the part of the total population of 37,303 people in the three wards where we implement the project. PROTOS also experienced the "improved traditional water wells" where the water table is close to surface and no other water ressources are available. During the last 3 years, tests have been done e.g. on the islands in the Kivu-lake (DR Congo). If there are no other ressources available, this can be a sound solution for rural, poor and isolated communities, but we have to consider that "safe water" is not easy with this technology. Infiltration of surface water can not be avoided and the infiltration time is not enough to clear the water from bacterial contamination - since the water table is not very deep. Tests we have done show an improvement of water quality, but not a water of generally recognised drinking water standards. 1°) Avoid any constructions, animals, latrines or even cultivation of the upstream land, so that the infiltrating water is not contaminated (or infiltrates much far away). 2°) Ask people to boil their water before drinking, especially for vulnerable groups such as small children. What is PADI doing with respect to hygiene sensitisation, spring protection, water quality monitoring and so on ? Thank you very much for your observation and recommendation. We have taken note. i) For the case of our areas this type of the well are constructed almost 100-350 meters away from homes and we do so in area where no way they can be accessing clean water for a number of years. •	To avoid washing, bathing , cultivating or doing any sort of human activities including cultivation of the upstream land to avoid deforestations and water contamination. According to our water Technician this technology help most of people accessing clean and safe water than those using open wells as shown in our attached photos provided the distance and above precautions are taken into consideration. For more clarification see the attached doc. Recommendation from Municipal Senior Water Techinician. Although I may not clearly understand the situation here, while water from shallow groundwater springs can often be of good quality, using such shallow (1.5 m) wells concerns me. There is only a brief mention of water quality tests of the proposed wells. Were these tests done with proper equipment, or just subjective judgement? Since the wells are only 1.5 meters deep, I wonder how they could possibly provide water of acceptable quality to the proposed beneficiaries over the long run. Pls explain how you can assure adequate water quality to the proposed consumers in such a situation. Material estimate and management of funds. What will be the depth of the wells you are going to construct and how realistic is the amount of cement to the 30 wells that will be constructed? Who will be directly responsible to manage the water maintenance funds? What will be the depth of the wells you are going to construct and how realistic is the amount of cement to the 30 wells that will be constructed? Who will be directly responsible to manage the water maintenance funds? iv.A cut off wall of good burnt bricks or sand-cement blocks is constructed downstream the convergences to receive the improved water supply. A box like space behind the wall is likewise filled with porous stones and then sealed with clay and backfilled with soil. viii.Improvement of water flow from the improved well is then carried out. Seems like a good project with an approach and techniques that are appropriate in the conditions at issue. Responsibilities however seem somewhat informal. That could be important for sustainable results and with an eye on connecting to other and future initiatives water suppy and sanitation. For long term sustainance and to ensure pure drinking water, the construction of shallow wells or stream would have been avoided for proper deep wells targetting the actual water table. PADI appears to be a very valuable organization in the community but assessing this proposal is difficult because the information is fragmented and incomplete. Aside from my concern about the very shallow wells (and the likelihood of contamination unless the wells are very well maintained and properly used by the beneficiaries), it seems to be a cost-effective use of the BPR/PWX funding. The management and O&M arrangements need to be better described, and they need to clarify the fact that “getting sanitation” means sanitary latrines, not just clean water to wash your hands with after defecation. There is also no detailed budget attached to the proposal. There is no mention of the words “cost” or “budget”. It would be helpful in the next round of PWX funding to provide a more detailed project proposal template so that organizations making proposals know exactly what information they need to provide in order to maximize the chances that their proposals will be successful. If there are no water ressources available, the technology might be the only option. 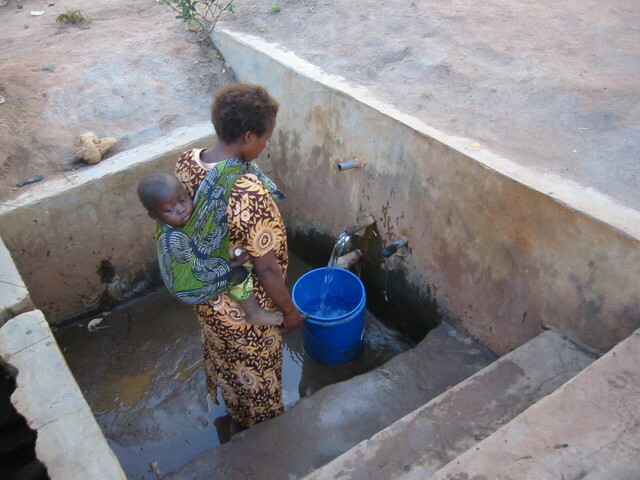 Nevertheless, these kind of water wells can not garantee a potable water . Therefor, other preventive and educational activities should be conducted. Monitoring water quality is essential in those circomstances. It seems that these elements are poorly developped in the proposal. This is a different and good approach that we would like to support. I would like to see results (from this or previous projects) at least one year after project completion, to see how the water quality is and the behavior change to protect water supply. Sanitation has been brought up as a concern and i hope that the project uses the experience of the other peers and adapts. I support grassroots orgs. I think they have much to share about implementation. For future proposal submissions, I think more attention to detail and description of models could make the submission much more effective.